Looking for labels? Stickers, decals, tags or flexible packaging? 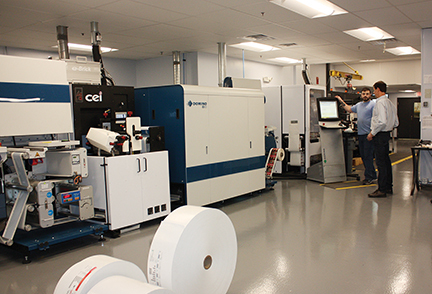 Amherst Label has been a leading innovator in specialty printing, on time and on budget for over 35 years. Longtime members of NH Made, Amherst Label (A LABEL for short) provides award-winning products with superior service at competitive prices. We have a simple philosophy: identify our customers’ needs and provide the solution. We take the pain out of label ordering. Our triple-tech approach to label manufacturing is one way we can do this. We have three top-of-the-line manufacturing processes to choose from in selecting the best way to produce your job on-time, on-budget and to specifications. Our award-winning screenprint department is legendary. Our flexo capabilities cannot be beat. And our new Domino digital department is game-changing. The highest quality printing, in ANY quantity including one! No plates needed, consistent. Affordable. Excellent. But bottom line, our people—their knowledge, their attention to detail and their caring—are what set us apart. When it comes to labels, we really apply ourselves. Call Dawn at 800-458-0777 and let us show you how everything is better with A LABEL.